I wanted to make something with an inspirational message for the teachers. Something they might use and enjoy. So hence the idea of a bookmark. Image - Tiddly Inks "School Girl"
Very sweet Dawn - great job. Beautiful tag ! Simple and clean style as I like. Your work of colors on your caracter is very successful.That tempts to recover in the reading. Bravo ! What a gorgeous bookmark - fabulous colouring. Thanks for sharing with us at Crafty Ribbons in our Traditional Christmas challenge this time. Good luck. Love it! What a lovely pressie! The image is fabulous! Thanks for joining us at Charisma Cardz. 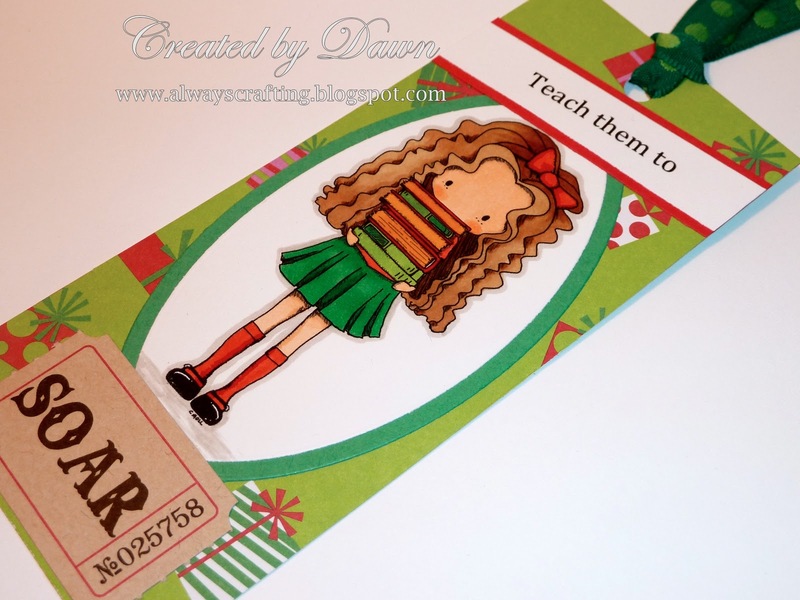 This is a lovely Christmas bookmark. Thank you for playing with Charisma this week. Thanks for joining in with us over at Colour Create. Hi Dawn; your childrens teachers must be happy to receive so cute and handmade bokmarks! Thanks for participating with your work in Crafty Ribbons Challenge for this fortnight! Your bookmark is adorable! Thank you for joining our “Use GREEN!”challenge at Meljen’s Designs. A really great creation, love the fab motiv. This looks fabulous! Gorgeous bright christmas colours and great image.